Tender (only) for China-made Hornby LMS 8F loco In very good condition in plain black, the only lettering is 'NE' on both sides. The loco was used as a chassis donor for a kit. État : Occasion. dans sa boite d origine. Used model railways & collections always wanted. Suitable For Super Detail Loco Drive China Made A4 Class Fitted With Speedo. HS1-9, IV41-53, 55-56, KA27-28, KW15-17, PA20, 41-49, 60-78, PH42-44, ZE1-3 (48-120 Hours subject to ferry schedules and weather) Up to 20 kilos £25.99. Hornby Trains Sets. 14.1mm 2 Hole Wheels. TOP categories. Contents: 10 x assembled sets. Sylvanian Familes. Tamiya RC Cars. Sylvanian Families. Plastic Model Kits. Used model railways & collections always wanted. Part Listed On Hornby Service Sheet Number: 418, Part No: 14. HS1-9, IV41-53, 55-56, KA27-28, KW15-17, PA20, 41-49, 60-78, PH42-44, ZE1-3 (48-120 Hours subject to ferry schedules and weather) Up to 20 kilos £25.99. Used model railways & collections always wanted. Part Listed On Hornby Service Sheet No: 424, Part No: 4. Suitable For Model Nos: R9291 (Tender Drive). HS1-9, IV41-53, 55-56, KA27-28, KW15-17, PA20, 41-49, 60-78, PH42-44, ZE1-3 (48-120 Hours subject to ferry schedules and weather) Up to 20 kilos £25.99. Hornby X9376 Driving Wheel Set (Grey) For The Class A4 Loco. Used model railways & collections always wanted. Part Listed On Hornby Service Sheet No. 275e. HS1-9, IV41-53, 55-56, KA27-28, KW15-17, PA20, 41-49, 60-78, PH42-44, ZE1-3 (48-120 Hours subject to ferry schedules and weather) Up to 20 kilos £25.99. NOUVELLE LOCO HORNBY CORPS 2-8-0 LMS CLASSE 8F COMPLÈTE MARGATE PRODUIT CORPS SHELL NUMÉROTÉ. PAS DE RACCORDS. NUMÉRO D'IDENTIFICATION 48758 - DÉTERMINÉ PAR APPEL D'OFFRES. OFFERT EST UN ENSEMBLE DE NEUF SEUL PANTOGRAPHE UN & ASSEMBLÉES B POUR S’ADAPTER AU SOMMET DE LA HORNBY CLASSE 373 EUROSTAR OU GNER DES LOCOMOTIVES ÉLECTRIQUES. PIC MONTRE CELLE DÉFINIE D’UN & ASSEMBLÉES B MONTÉ SUR UN CORPS DE GNER (NON INCLUS DANS L’OFFRE). LES PANTOGRAPHES MONTER ET DESCENDRE, MAIS SONT PAR AILLEURS NON OPÉRATIONNELLES. SAISIR MAINTENANT AVANT QUE QUELQU'UN D’AUTRE LE FASSE !!! DIFFICILE À TROUVER QUAND VOUS VOULEZ QUELQUES DONC STOCK JUSQU'À MAINTENANT. MOINS CHER SUR EBAY UK POUR L’ARTICLE AVEC LA LIVRAISON AU MOMENT DE LA PREMIÈRE COTATION. POUR PLUS DE BONNES AFFAIRES S’IL VOUS PLAÎT CONSULTEZ MA BOUTIQUE À TONYSSTOREONLINE. OFFERT EST UN X6921 PRISE PRISE ET LE FIL. CONVIENT À THOMPSON 01 VOIR AUSSI OUTIL D’EXTRACTION X6468 ÉGALEMENT DISPONIBLE SUR MES ANNONCES. PARTIE RÉPERTORIÉE SUR HSS 387 MAIS NUMÉRO INCORRECT RÉPERTORIÉ. CE NOMBRE - X6921 - EST CORRECT. Used model railways & collections always wanted. Part listed on Hornby Service Sheet nos. 280 & 287. HS1-9, IV41-53, 55-56, KA27-28, KW15-17, PA20, 41-49, 60-78, PH42-44, ZE1-3 (48-120 Hours subject to ferry schedules and weather) Up to 20 kilos £25.99. Hornby X8254 Class J94 0-6-0 Loco Driving wheel set. Used model railways & collections always wanted. Part listed on Hornby Service Sheet nos. 211e & 385. Isle of Wight HS1-9, IV41-53, 55-56, KA27-28, KW15-17, PA20, 41-49, 60-78, PH42-44, ZE1-3 (48-120 Hours subject to ferry schedules and weather) Up to 20 kilos £25.99. Hornby X6472 Fowler Class 2P Loco Driving Wheel Set (Black). Used model railways & collections always wanted. Fits the Hornby Fowler 2P 4-4-0 model R3028 (loco drive). HS1-9, IV41-53, 55-56, KA27-28, KW15-17, PA20, 41-49, 60-78, PH42-44, ZE1-3 (48-120 Hours subject to ferry schedules and weather) Up to 20 kilos £25.99. Used model railways & collections always wanted. Part listed on Hornby Service Sheet no. 378. HS1-9, IV41-53, 55-56, KA27-28, KW15-17, PA20, 41-49, 60-78, PH42-44, ZE1-3 (48-120 Hours subject to ferry schedules and weather) Up to 20 kilos £25.99. Used model railways & collections always wanted. Part Listed On Hornby Service Sheet No: 418, Part No: 7. HS1-9, IV41-53, 55-56, KA27-28, KW15-17, PA20, 41-49, 60-78, PH42-44, ZE1-3 (48-120 Hours subject to ferry schedules and weather) Up to 20 kilos £25.99. Used model railways & collections always wanted. Part Listed On Hornby Service Sheet No. 257e. Isle of Wight HS1-9, IV41-53, 55-56, KA27-28, KW15-17, PA20, 41-49, 60-78, PH42-44, ZE1-3 (48-120 Hours subject to ferry schedules and weather) Up to 20 kilos £25.99. 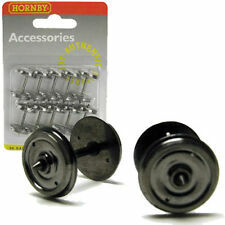 Hornby X9090 Driving Wheel Set Black (6 Wheels on 3 Axles) With Drive Gear For The Duchess Class loco. Used model railways & collections always wanted. Part Listed On Hornby Service Sheet No. 223e. HS1-9, IV41-53, 55-56, KA27-28, KW15-17, PA20, 41-49, 60-78, PH42-44, ZE1-3 (48-120 Hours subject to ferry schedules and weather) Up to 20 kilos £25.99. Used model railways & collections always wanted. Part listed on Hornby Service Sheet no. 380. HS1-9, IV41-53, 55-56, KA27-28, KW15-17, PA20, 41-49, 60-78, PH42-44, ZE1-3 (48-120 Hours subject to ferry schedules and weather) Up to 20 kilos £25.99. PACK de A est et offert des X8052W 4 x HORNBY nouveaux accouplements WEATHERED ARRÊTOIRS de C/W. COSTUMES DE CHINE CLASSE 2P, CLASSE 4F, R6015 ROLLING STOCK ET SIMILAIRES. POUR PLUS DE BONNES AFFAIRES S’IL VOUS PLAÎT CONSULTEZ MA BOUTIQUE À TONYSSTOREONLINE. ACHETEURS ÉTRANGERS SONT LES BIENVENUS, MAIS S’IL VOUS PLAÎT VÉRIFIENT LES PAIEMENT ET LES MODALITÉS POSTAL. MERCI DE LIRE LES PETITS CARACTÈRES CI-DESSOUS - IL EST LÀ POUR VOTRE PROTECTION - ET LE MIEN ET D’ÉVITER LES MALENTENDUS. POURQUOI NE PAS CONSULTER MES AUTRES ARTICLES ET ÉGALEMENT MES COMMENTAIRES POUR VOTRE ASSURANCE. ACHAT HEUREUX. OFFERT EST UNE CARTE PCB PRINCIPALE POUR LA VOITURE ELECTRIQUE PENDOLINO DUMMY. Partie indiquée sur la fiche de service Hornby no. 300c. Used model railways & collections always wanted. Part listed on Hornby Service Sheet no. 376. HS1-9, IV41-53, 55-56, KA27-28, KW15-17, PA20, 41-49, 60-78, PH42-44, ZE1-3 (48-120 Hours subject to ferry schedules and weather) Up to 20 kilos £25.99. Used model railways & collections always wanted. Part Listed On Hornby Service Sheet No. 290D. HS1-9, IV41-53, 55-56, KA27-28, KW15-17, PA20, 41-49, 60-78, PH42-44, ZE1-3 (48-120 Hours subject to ferry schedules and weather) Up to 20 kilos £25.99. Used model railways & collections always wanted. Part Listed On Hornby Service Sheet No: 419, Part No 8. HS1-9, IV41-53, 55-56, KA27-28, KW15-17, PA20, 41-49, 60-78, PH42-44, ZE1-3 (48-120 Hours subject to ferry schedules and weather) Up to 20 kilos £25.99. Hornby X6409 Class 86 Drive Unit Wheel Set with Traction Tyres. Used model railways & collections always wanted. HS1-9, IV41-53, 55-56, KA27-28, KW15-17, PA20, 41-49, 60-78, PH42-44, ZE1-3 (48-120 Hours subject to ferry schedules and weather) Up to 20 kilos £25.99. Hornby X9089 Driving Wheelset Black (6 Wheels On 3 Axles) With Drive Gear For The Black 5 Loco. Used model railways & collections always wanted. Part Listed On Hornby Service Sheet No. 357e. Isle of Wight. Hornby X8871M (Modified) 0-6-0 loco Wheel Set in Black. Used model railways & collections always wanted. Part listed on Hornby Service Sheet no. 308b. Isle of Wight HS1-9, IV41-53, 55-56, KA27-28, KW15-17, PA20, 41-49, 60-78, PH42-44, ZE1-3 (48-120 Hours subject to ferry schedules and weather) Up to 20 kilos £25.99. Hornby R8234 - 10 x (Essieux) 14.1 mm Jeux de roues pour entraîneurs à disque en métal et 4 trous. Hornby R8234 - 10 x (Essieux) 14.1 mm Jeux de roues pour entraîneurs à disque en métal et 4 trous 00 GAUGE. Hornby X9394 Tender Wheel Set For The Class A1 Loco (Loco Drive). Used model railways & collections always wanted. Part listed On Hornby Service Sheet No. 284b. HS1-9, IV41-53, 55-56, KA27-28, KW15-17, PA20, 41-49, 60-78, PH42-44, ZE1-3 (48-120 Hours subject to ferry schedules and weather) Up to 20 kilos £25.99. OFFERED IS A HORNBY MARGATE CLASS 37 OR 47 WORKING MOTORISED BOGIE. NR XCLNT . TYRED. AS PICTURED ON LISTING. MORE BARGAINS - PLEASE CHECK OUT MY SHOP. Hornby X9613 M7 Class 0-4-4 Loco Driving Wheel Set - Black. Used model railways & collections always wanted. Part Listed On Hornby Spares Sheet No. 288. HS1-9, IV41-53, 55-56, KA27-28, KW15-17, PA20, 41-49, 60-78, PH42-44, ZE1-3 (48-120 Hours subject to ferry schedules and weather) Up to 20 kilos £25.99. Hornby X8871W 0-6-0 Loco Wheel set in black with Weathered finish. Used model railways & collections always wanted. Part listed on Hornby Service Sheet no. 201e. Fitted with Traction Tyres. Isle of Wight. Used model railways & collections always wanted. Part Listed On Hornby Service Sheet 253. HS1-9, IV41-53, 55-56, KA27-28, KW15-17, PA20, 41-49, 60-78, PH42-44, ZE1-3 (48-120 Hours subject to ferry schedules and weather) Up to 20 kilos £25.99. Used model railways & collections always wanted. Part listed on Hornby Service Sheet no. 383. HS1-9, IV41-53, 55-56, KA27-28, KW15-17, PA20, 41-49, 60-78, PH42-44, ZE1-3 (48-120 Hours subject to ferry schedules and weather) Up to 20 kilos £25.99. Hornby R8264 Jeu d'essieu pour essieu de roue à disque 2 trous de 14.1 mm de diamètre x 10 neuf scellé. Hornby X6458 Class D49 Tender Wheel Set. Used model railways & collections always wanted. HS1-9, IV41-53, 55-56, KA27-28, KW15-17, PA20, 41-49, 60-78, PH42-44, ZE1-3 (48-120 Hours subject to ferry schedules and weather) Up to 20 kilos £25.99.